Vipi Facings are the newest innovation in dentistry. They provide the dentist or laboratory with an exceptional aesthetic result and provide viable alternatives to many different dental techniques. Truly a diverse, multi-purpose product, Vipi facings are designed to allow a broad range of techniques, from self-curing/quick cure resins to heat cure techniques or light cure stain effects. 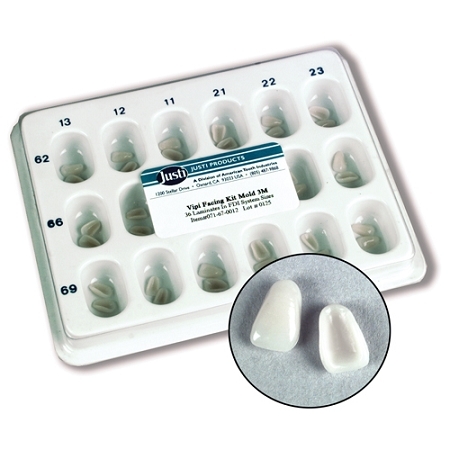 Vipi Facings come in five popular molds and three easily modifiable shades. The diversity of use allows for a very easy, fast, and high quality result. Vipi Facings are an excellent alternative for provisional situations and transitional cases. Their use is limited only by the resourcefulness and creativity of the dentist or technician. An Instruction Brochure is also available upon request. Kit Contains: Shades 62-66-69 - 36 pcs.